The study of money, banking and financial markets is a required or very popular elective in most undergraduate and graduate programs in economics and finance in Africa. However, the textbooks used are those written primarily for the developed world such as the United States or the U.K. The result is that students graduate with excellent theoretical knowledge about the subject matter as it pertains to the developed economies, but lack the ability to apply the same knowledge to less developed economies. Although the subject matter of money and banking can be treated at a theoretical level, it is best done with institutions in mind. As an application oriented course, references and applications should, as much as possible, be to the conditions and institutions present in the environment where the subject is being studied and where the knowledge will be used, rather than to institutions that exist elsewhere in developed economies. 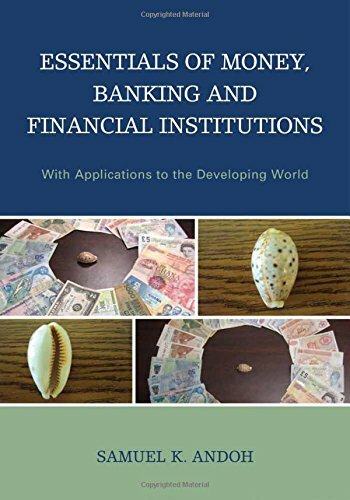 The primary purpose of Essentials of Money, Banking and Financial Institutions is to provide a text in money, banking, and financial institutions in the context of the developing economies, especially Africa. Throughout the book, a deliberate effort will be made to focus the students’ attention on the need to develop the existing institutions so they can help to accelerate economic development.